I never thought such after sales service would happen in Malaysia. Well, I bought a Pureen BPA free Gold bottle a few months back and passed it to nanny. Nanny passed it back to me after 2 months usage saying that the bottle is leaking. I checked and saw the bottle's neck was broken probably due to nanny tried too hard to close it. So I pass nanny a new bottle and kept the Pureen one in storeroom. 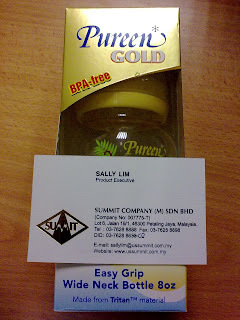 It happen that I met a guy at Pureen road show at Mid Valley event and feedback to him about this, he asked me to bring back the bottle to exchange for a new one. Since Pureen office is on my way back every working day so I tried my luck and brought back the broken leaking bottle. A product specialist girl there exchanged the bottle with me and apologized to me. She said she would check with the manufacturer and If I have any problems again, feel free to contact her again. Wow, this is really an amazing experience for me in Malaysia. Normally Malaysia companies don’t bother about after sales services, but Pureen does. Keep up the good work, Pureen.